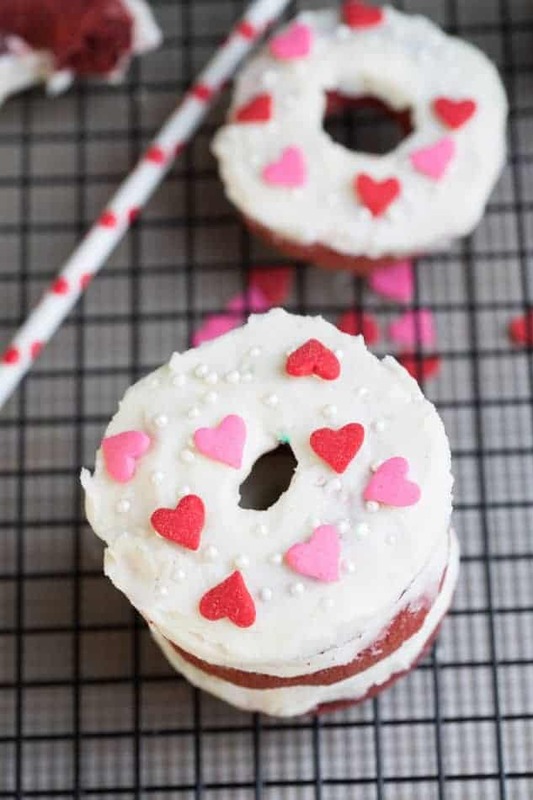 Since Valentine’s Day isn’t too far away, I brought these Red Velvet Cake Donuts to a party we went to over the weekend. 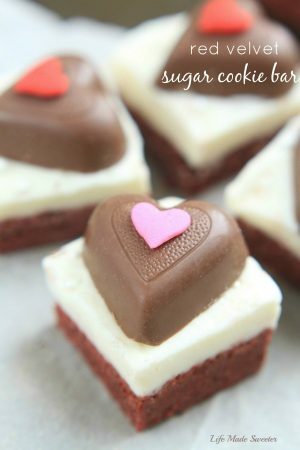 They make a fun and festive treat and are also pretty easy to whip up since you don’t need your mixer. I used melted coconut oil, non-fat plain Greek yogurt, and low-fat buttermilk to ensure that these donuts were moist and fluffy. 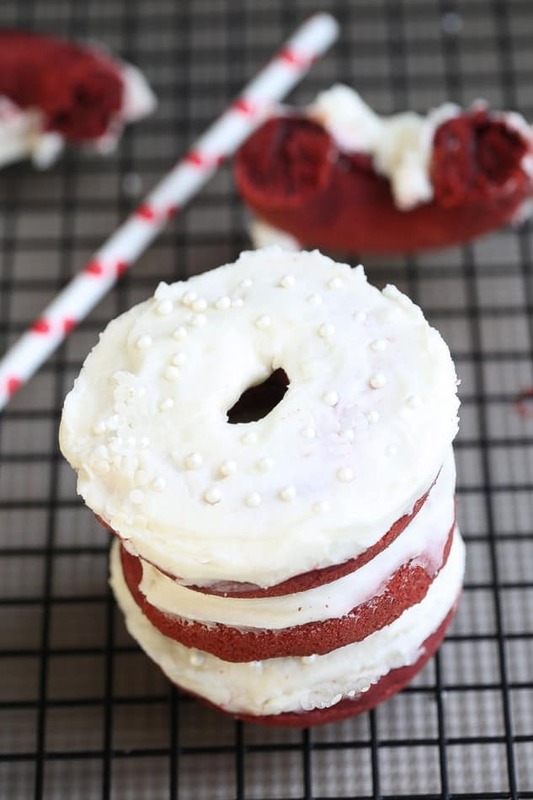 They had that perfect classic Red Velvet taste of chocolate and vanilla and were like soft and light cakey cupcakes in donut form and made the perfect base for a slightly tangy and sweet cream cheese glaze frosting. These donuts were a huge hit at the party and the birthday girl has already requested I make them again instead of cupcakes from now on. The batter only makes about 7 donuts (my donut pan can only hold 6 so I poured the remaining batter in my single mini bundt cake pan). The recipe can easily be doubled if you need to make more though. 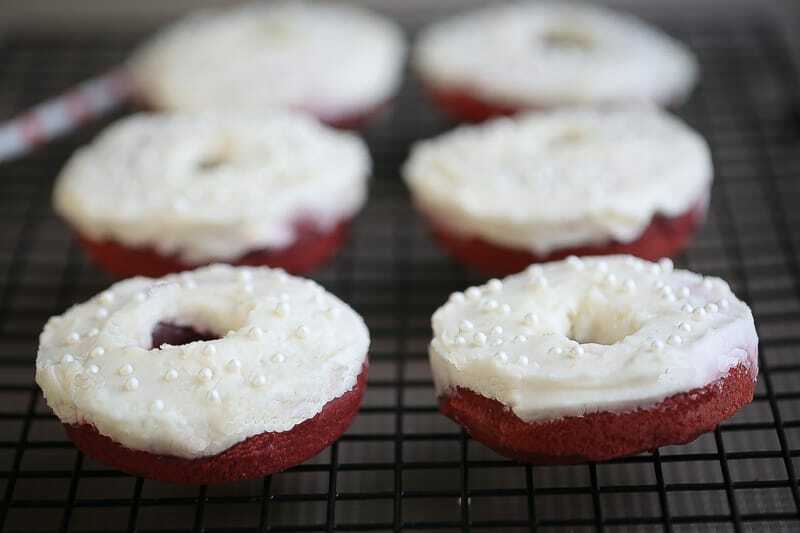 If you are a fan of red velvet, these donuts would make the perfect treat! 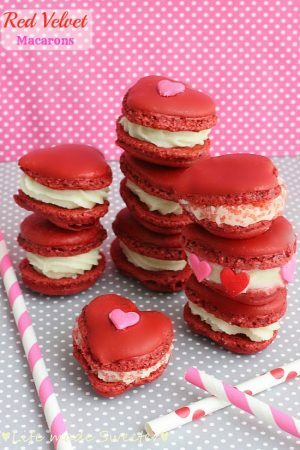 Feel free to dress them up with some pink and red sprinkles or hearts ❤❤ and share them with your sweetie on Valentine’s Day! Lightly spray donut pan with baking spray. In a large bowl, whisk together the flour, cocoa, sugar, baking powder, baking soda and salt. In a liquid measuring cup, pour in the buttermilk and whisk in egg, melted coconut oil, Greek yogurt, vanilla extract and distilled vinegar. Add the liquids to the flour mixture stirring with a rubber spatula until just combined. Add red food coloring a little bit at a time while stirring until desired color has been reached. 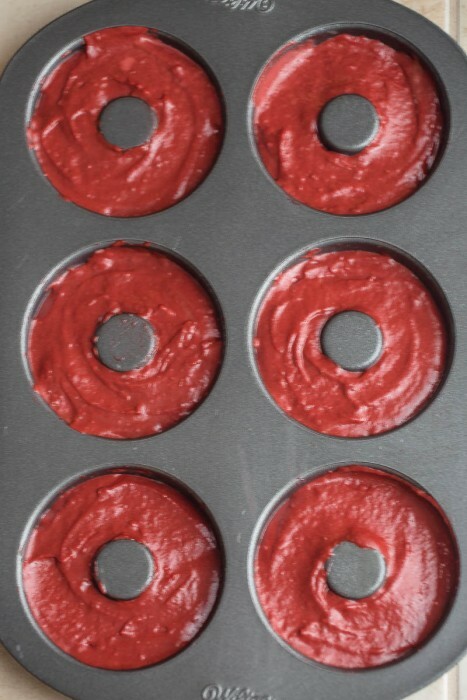 Using a small spoon fill each donut pan about 2/3 of the way full or you can transfer the donut batter to a ziplock or pastry bag and squeeze in. The batter was thick so I found using a spoon was easier. Bake for 7-8 minutes or until toothpick comes out clean and cool in pan for 5 minutes before moving to wire rack to cool completely before adding glaze. In a medium bowl, beat cream cheese and softened butter until smooth and combined. Add vanilla extract then slowly add powdered sugar a little bit at a time, beating until smooth. Add heavy cream one tablespoon at a time, until desired consistency has been reached. Spread frosting on cooled donuts and add sprinkles if desired.